Nissan's 2014 Armada is a big SUV designed for big jobs. With seating for up to eight people, a smorgasbord of electronic media and navigation equipment, and a tow rating of 9,000 pounds, the Armada is a good choice for large families on the go. That is, if they can afford the monthly fuel bill. Great vehicle and great family SUV. 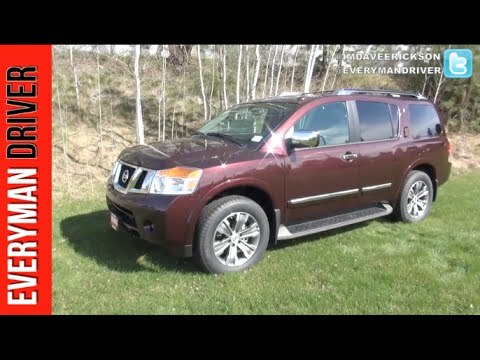 The Nissan armada is overall a very comfortable car. When I am driving down the road it is very quiet. Also, it is not bumpy at all. It has a lot of room and perfect for a family. It is easy to put in my toddler and to take to him out as well. My seat are easy to manage and fold down. The trunk is very spacious and perfect for luggage, coolers, strollers, and all your necessities. The only issue that I have had so far in the trunk lift gate. It would start opening and once it reached the top it beeped and closed automatically. Overall, it is a great vehicle. Armada review both power and performance. Vehicle has plenty of horsepower and is a very smooth comfortable ride. Top of the line model with all the bells and whistles. Only drawback is vehicle mileage could be much better. Vehicle is equipped with the trailer towing package and was used to tow my travel trailer with no problems until I bought a motorhome. Safety, comfort and reliability are awesome. I absolutely love my 2014 Nissan armada! I recently took a trip with my two children and three of my grandchildren, all three still in car seats. We had a great trip, we were all very comfortable and it has plenty of cargo space. Absolutely the best everyday vehicle or travel vehicle.